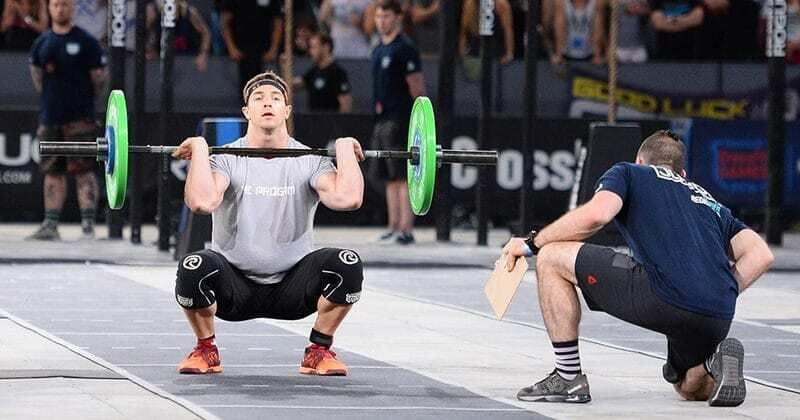 CrossFit open Workout 18.5 is a tough mix of thrusters and C2B Pull Ups. Tighten up your technique and get ready to smash the last workout of 2018. The starting position for a thruster is the front squat, but to get into it you need to load the bar on your shoulders using the clean. Also to reach a valid rep the bar needs to finish overhead with elbows extended and locked. Sounds easy, but not so when a nice amount of them is combined with chest-to-bar pull ups or burpees. The following reasons with tips should help you cycle thrusters through MetCon workouts a bit faster, and a bit easier. Foundations for thrusters are built with front squats: a squat variation where the barbell is positioned on your (front) shoulders. Which means your torso needs to be upright, so the weight together with your body gets balanced properly. To keep the torso upright, you need a sufficient mobility in your ankles and hips, and a good core strength that will allow you having a better control over the weight and movement itself.In general, the demand for overall mobility is much higher than with back squats. In the bottom position make sure you keep the weight on the heels. Engage core and drive up with your hips. Learn how to activate and use both within the movement. Your thrusters will benefit from strength built with front squats.